Certifying copies of documents is a common practice for a notary. As a notary public, a certain language or verbiage much be attached or stamped on the document. If it is not, you must hand write every word required per your state. With our Slim Certified Copy Stamp you will always be prepared and will never have to hand write the verbiage again. The Slim Certified Copy Stamp is slender in size and can fit effortlessly in to a purse, briefcase or even a pocket. 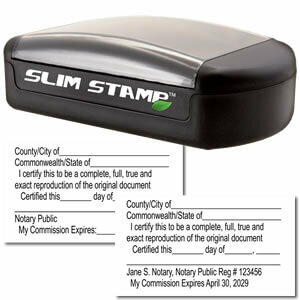 The Slim Certified Copy stamp is a must-have for all notaries whether you are always on-the-go or have an overflowing drawer of bulky notary supplies. Every stamp in our slim line, including our Slim Certified Copy stamp, are pre-inked stamps. Pre-inked stamps are made with an eco-friendly process that reduces the production of waste and emissions in manufacturing. The Slim Certified Copy stamp has a built-in inkwell that never has to be replaced and can last for thousands of impressions. When it is time to re-ink, you can simply pull back the clear top and squeeze a few drops of ink in the designated slit. The pre-inked Slim Certified Copy stamp is guaranteed to leave a beautiful impression every time it is used with little effort.